Not every leaf of a plant is subjected to the same light intensity or quality in nature. As a consequence, plants have evolved multiple signaling pathways to transduce light‐related signals between different leaves. 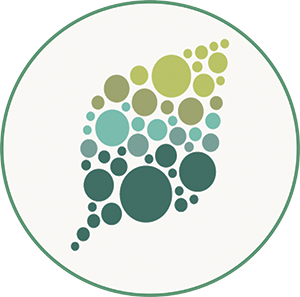 These systemic acclimation processes optimize the overall light perception of the plant and prevent photoinhibition in leaves that are not yet acclimated to high light intensities. Although local responses to light stress have been extensively studied in leaves, little is known about the systemic responses that occur in distant leaves or in the different tissues that connect the local and distant leaves. Because in addition to light stress, systemic signals such as the ROS/Ca2+/hydraulic/electric waves are triggered by many other stimuli such as wounding, salinity or biotic stimuli, the exact metabolic changes that occur in the tissues transporting the systemic signal could be responsible for the specificity of the transmitted response. In addition, they could be required for supporting the active production of ROS during the propagation of the ROS wave. To address these important questions, and to identify key metabolites associated with the systemic acclimation response of plants to light stress, Choudhury et al. (10.1104/pp.18.01031) conducted time‐course metabolic profiling analyses of local leaves, systemic tissues and transport tissues (tissues connecting the local and systemic leaves) in response to light stress. 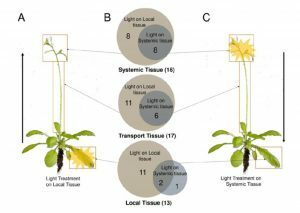 They report that the local application of light stress to one rosette leaf of a bolting Arabidopsis thaliana plant results in a metabolic response that involves local, systemic and transport tissues. Many of the systemically altered metabolites are associated with the propagation of a reactive oxygen species (ROS) wave. The level of eight different metabolites is altered in a similar manner in all tissues tested (local, systemic, and transport). These compounds presumably constitute a specific metabolic signature for light stress that propagates from the local to the systemic leaves.